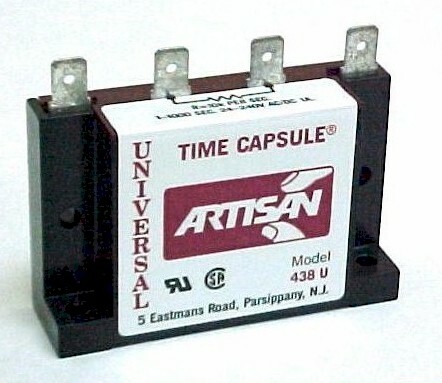 The model 438U (Universal Time Capsule) is an all Solid State timer providing Delay on Make control to any load operating from 19 to 288V AC or DC. The time delay is adjustable from 1 to 1000 or 2-2000 seconds depending on the model selected, and is obtained by connecting a fixed resistor or potentiometer across the middle terminals (10k per sec). When power is applied, the 438U remains in the off state. After the preset period has elapsed the timer switches on energizing the load. Frequency 50 / 60 HZ, for AC input voltages. Timing Range 1-1000 and 2-2000 Seconds. Timing Tolerance +/- 10% of calculated value. Timing Adjustment Connect resistance (10K per second) across two center terminals. Unit has a 1 second internal delay.